Walk along any river bank, beachfront, or marine location, it’s near-guaranteed you will find at least one piece of plastic. Since the introduction of the first polyethylene bag in the 1960’s, the human reliance on single-use plastic has grown. We now use the material in almost every part of our lives, and it’s having a devastating effect on the environment. Not only does around 8 million tons of plastic enter our oceans every year, but they break down into smaller pieces with particles of micro-plastics, eventually finding their way into the food chain. We’re polluting the oceans, destroying natural marine habitats and causing untold damage on our own health. Plastic not only sinks to the depths of the ocean, it directly impacts the marine life that lives there. On recent estimations, an upward of 100,000 marine mammals are killed every year as a result of eating plastic. Scientists exploring the deepest ocean trenches in Japan, the Hebrides, and Chile have found plastics in every nook. More worryingly, when testing the wildlife that lives there, 100% of creatures in one spot had plastic in their gut. The sight of a dead animal washed ashore is no longer a shock: whales, turtles, dolphins and other marine life are ingesting a stomach-full of plastic, before suffocating, then washing up on coastlines. Nearly 700 marine species are directly affected by our habits on land. With the heads of the United Nations Environment agency warning of an impending ‘Ocean Armageddon’ unless we phase out our reliance on single-use items such as bags, bottles, straws, and cutlery. It seems we are still a long way from achieving the circular economy in which we re-use and recycle most items, instead of disposing of them straight into landfill. How Much Plastic Do Humans Consume? Researchers at Columbia University’s, Lamont-Doherty Earth Observatory recently studied the digestive tract of market-bought shrimp to ascertain what it had consumed. A small application of red dye immediately flagged a startling insight: seven pieces of plastic in the stomach of one shrimp bought for human consumption. This is not uncommon. Scientists have found plastic fibers, fragments, and micro-beads in both ocean-going and freshwater fish, wild-caught and farmed. 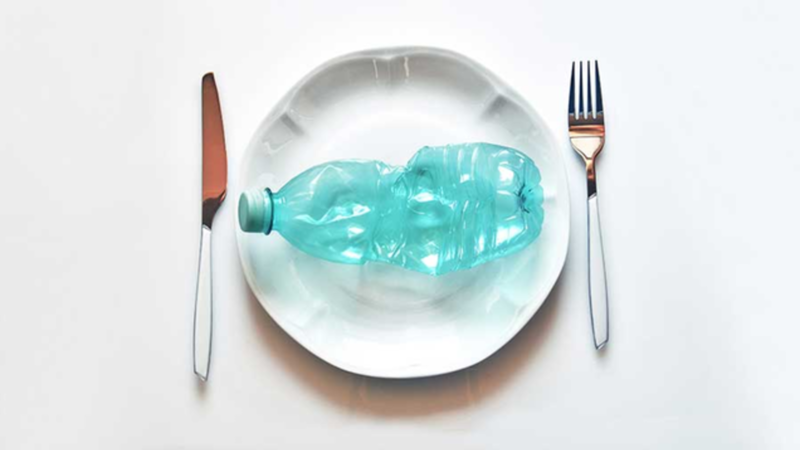 With 114 species known to have plastic in their stomachs; more than half of which we freely eat for dinner. Species such as plankton, bivalves, fish and whales regularly consume microplastics as they look just like their food, clogging digestive tracts, impeding appetite, altering feeding behavior and affecting both growth and reproductive capability. How Does This Affect What Is On My Plate? While the plastic pollution has a devastating impact on marine life, a UN report on the effect on humans concludes people likely consume trivial volumes of plastic. However, scientists remain concerned. Micro-plastics will eventually break down into nano plastics less than 100-billionths of a meter in size and these are the particles that can penetrate tissues and organs, presenting potential toxicity to humans with severe consequences owing to bioaccumulation in our system. Research is currently limited by scientific capability, but we must reduce the volume of plastic entering our lakes, rivers, and oceans to keep it out of our food chain. Which Plastics Should You Avoid? A plastic bag has an average usable life of just 12 minutes but will survive in the marine environment for thousands of years, including in the digestive tract of a whale. The US has slowly introduced legislation to outlaw single-use bags in several states, but as shown in the map below, efforts could stretch much further. Parts of the West Coast have introduced a total ban, including California and Hawaii, which remain the only territories to do so. Other Western, and a handful of Eastern territories have introduced regional bans or levies, but these do not stretch to an outright ban. Central states have remained immovable, introducing no restrictions at all while Michigan, Missouri and Idaho have gone so far as to ‘ban any bans’ on single-use plastic bags. If we re-use plastic, it becomes less of a concern; unless it is the type to contain BPA. Bisphenol A is a hormone-disrupting material linked to autism, birth defects, and reproductive issues. Remember to check any plastic used and avoid anything suggesting BPA, particularly in children’s cups and bottles which frequently include the compound. Number 3 - Polyvinyl Chloride (PVC): Contains di-2- Ethylhexyl phthalate (DEHP), an endocrine disruptor and possible carcinogen. Number 6 – Polystyrene (PS): It can leach styrene, another endocrine disruptor, and probable carcinogen, into food. Number 7 – Polycarbonate: contains BPA. When it comes to recyclable plastics, this is dependent on your location. In general, numbers 1 and 2 are the most readily recyclable materials. They should be rinsed, then disposed of in the appropriate recycling bins for collection by local authorities. For other numbers, check to see if your local facility can process them for recycling. As a rule, avoid 3, 6 and 7 as best you can. How Can Organizations Become More Eco-Friendly? Fixing the situation starts at the top, and so we should set the right agenda to encourage positive behavior. Even if plastic is vital to daily operations, we can encourage sustainable behavior by providing recycling bins for plastics, paper, and other waste. If you are concerned about the lack of engagement, implement a policy to ensure those around you make use of the amenities provided. Food wrappers often use plastic type 3, an endocrine disruptor and possible pollutant, which is not readily-recyclable. If we are forced to purchase lunch from food outlets, this means having to buy single-use type 3 plastics. However, by getting creative in your kitchen facilities, you can make the most of eating healthy whilst reducing consumption of environmentally unfriendly plastics. Whether in the products sold, communications sent, or even at the water dispenser; there are multiple areas you can reduce your reliance on plastic. Minimize packaging where possible, encourage the use of reusable drinks bottles, and provide plates, cutlery, and cups. Waterlogic a leading global supplier of sustainable water dispenser solutions, raise essential questions about our impact on the environment and the affirmative steps we should take to promote sustainability.